X AND X for both keywords. X OR X for either keyword. X AND X NOT Y excludes Y. Search by Pattern # too! By Bust SizeBust 28"Bust 29"Bust 30"Bust 31"Bust 32"Bust 33"Bust 34"Bust 35"Bust 36"Bust 37"Bust 38"Bust 39"Bust 40"Bust 41"Bust 42"Bust 43"Bust 44"Bust 45"Bust 46"Bust 47"Bust 48"Bust 49"Bust 50"
By Waist SizeWaist 22"Waist 23"Waist 24"Waist 25"Waist 26"Waist 27"Waist 28"Waist 29"Waist 30"Waist 31"Waist 32"Waist 33"Waist 34"Waist 35"Waist 36"Waist 37"Waist 38"Waist 39"Waist 40"Waist 41"Waist 42"Waist 43"Waist 44"
By Hip SizeHips 32"Hips 33"Hips 34"Hips 35"Hips 36"Hips 37"Hips 38"Hips 39"Hips 40"Hips 41"Hips 42"Hips 43"Hips 44"Hips 45"Hips 46"Hips 47"Hips 48"Hips 49"Hips 50"
Bust 34-38", Waist 26.5-30", Hips 36-40"
1986, 80s Summer, Retro Casual Easy Clothing Patterns - MISSES' SKIRTS: Full, flared skirt A and straight skirts B and C have buttoned front opening, pockets in side seams and two rows of elastic in waistline casings. 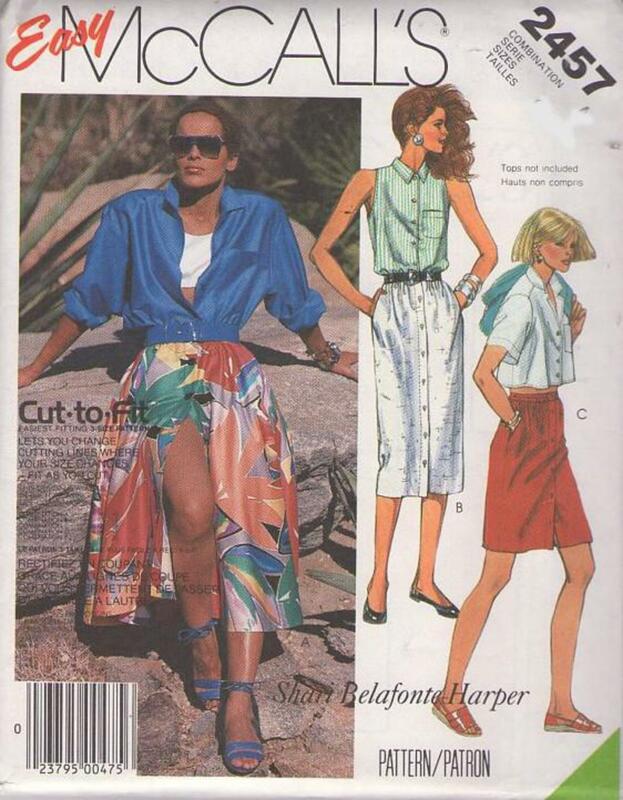 CONDITION: This original vintage sewing pattern is out of print, Discontinued New Old Stock, uncut & unused! All pieces appear to be complete and intact and have been neatly refolded with the original instructions. ©2004–2019 MOMSPatterns Vintage Sewing Patterns, All Rights Reserved.